It's that time of year again! The Norfolk County Fair is October 6th - 12th! You can get your ride all day vouchers at Roulston's Pharmacy for only $28 until October 5th! 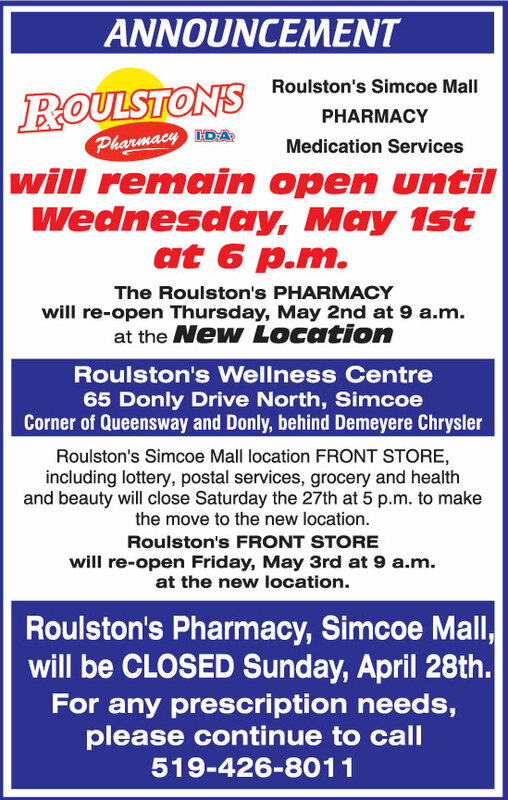 FREE Flu Shots are available at Roulston's. Call for YOUR free appointment. New Hours for Downtown Location! The changes to our business hours at our Downtown store are effective today, September 15th. Monday - Wednesday 9 a.m. to 6 p.m.
Thursday & Friday 9 a.m. to 8 p.m.
2013 Commitment to Care and Service Award! Vitamin and Home Health Care savings available until November 13th! Flu shots are administered by a specially trained Pharmacist. Appointments are recommended, but drop-ins are welcome subject to vaccine supply. Ontario residents 5 years of age and up with a valid Health Card (please bring to Clinic) are eligible. Please call TODAY to book your FREE appointment. For any prescription needs, call 519-426-8011 or visit one of our other locations. New Wellness Center Opens May 2nd! We'd like two welcome two new members to the Roulston's team, Ashley Gubbels-Smith and Natasha Grincevicius.